LONDON (AP) — Inflation across the 19-country eurozone has fallen to its lowest level this year, official figures showed Wednesday, in a development that may temper speculation that the European Central Bank will soon consider easing up on its monetary stimulus. Eurostat, the EU’s statistics agency, said that inflation fell to 1.4 percent in the year through May from 1.9 percent the month before. May’s rate is the lowest rate since December 2016 when inflation stood at 1.1 percent. The most important reason why inflation has been so volatile in recent months is connected to the price of oil, which is off the lows recorded last year but still swinging fairly widely. In the year to May, energy prices were up 4.6 percent. However, May’s increase was the smallest this year and down sharply on April’s equivalent rate of 7.6 percent. The decline in the rate, which was slightly sharper than anticipated, means that inflation has fallen away from the ECB’s target of just below 2 percent. The rise in inflation in April to the target had stoked talk in financial markets that the central bank would soon be in a position to at least start mulling the possibility of withdrawing some of its stimulus, possibly at next Thursday’s policy meeting. The ECB has slashed interest rates, including its main one to zero, and embarked on a big bond-buying stimulus program to keep a lid on market interest rates. Its primary aim is to get inflation back toward its target and then to start easing off the bond-buying program. A major reason why inflation fell back sharply in May was the decline in the core rate, which strips out the volatile items of alcohol, food, tobacco and energy. That slipped back to 0.9 percent from the previous month’s 1.2 percent. 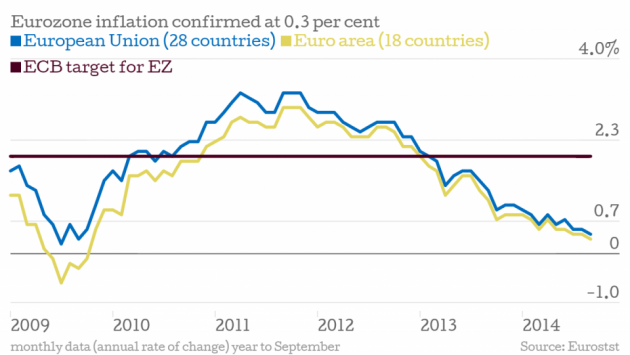 Modest underlying rates of inflation point to sluggish wage demands even at a time when the eurozone economy is performing relatively strongly and unemployment has been dropping. ECB President Mario Draghi has pointed to the subdued core rate in recent months to urge caution over the bank radically changing tack soon. “That should allow the ECB to continue to stress that underlying inflation pressure in the euro area remains weak, despite strengthening growth, when it meets next week,” said Cathal Kennedy, European economist at RBC Capital Markets. As a result, Kennedy says that while the ECB is likely to upgrade its economic forecasts on Thursday, it will probably remain cautious about any talk of tapering off the stimulus program. Some economists think Draghi may drop any reference in his statement to the possibility of lowering interest rates or increasing stimulus going forward. A raft of indicators over recent weeks has shown that the eurozone economy has picked up steam, particularly in France and in many of those countries that have been at the heart of Europe’s debt crisis, including Spain and Ireland. The rebounding economy was evident in unemployment figures from Eurostat. The agency found that the eurozone’s jobless rate fell 0.1 percentage point in April to 9.3 percent, its lowest level since March 2009, when the region, like the world economy, was in the midst of a savage downturn following the global financial crisis. During April, Eurostat said 233,000 people came off the eurozone’s jobless register, taking the total unemployed down to 15.04 million.